Originally made with whole wheat flour, this recipe is easily transformed into Gluten-Free if using GF oats, making many people especially happy. Please be aware that these pancakes are absolutely delicious. This Wholetarian approved recipe is healthier than most recipes, but is still higher on the Glycimic Index than one should ever want in a single sitting. Consider saving this recipe for rare special occasions or on the side with a meal of protein and lots of vegetables like a vegetable omelet. 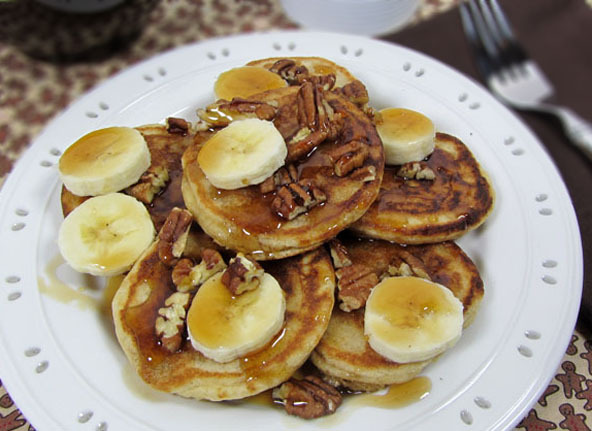 I originally created this Wholetarian pancake recipe using both oat flour and quinoa flour but found that I prefer to use one type of flour, so with less milk I could make it with just oat flour (just to simplify things). I never keep oat flour or quinoa flour on had because they would likely go rancid before using them. But I do keep oat grouts or steel oats and quinoa on hand. When I want to make them into flour, I just toss them in small batches into my Vita-Mix and blend them into instant fresh flour for my recipe. I usually double this recipe and freeze the rest for a quick future breakfast for my kids. Prepare once and use twice is what I'm all about! Be sure to layer parchment paper between the pancakes so they won't stick together. Put in a plastic baggie and freeze. Warm up in a toaster oven. Add the first group of the ingredients into a large mixing bowl and beat together with beaters or blend using a blender. The batter will thicken the longer it sits. Pre-heat a skittle to medium-high heat, coating with a small amount of coconut oil to keep the pancakes from sticking. Pour batter into circles on the skittle and watch the bubbles form on top. Once it is firm enough on the bottom, flip it over to cook on the other side until golden brown. If desired, stir in one or a combination of any of the optional ingredients into the batter. 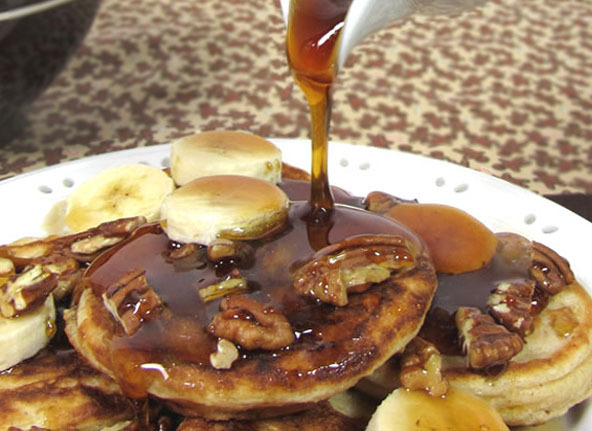 Or save the optional ingredients as a topping with Wholetarian Blend Syrup as I did here in the next photo. 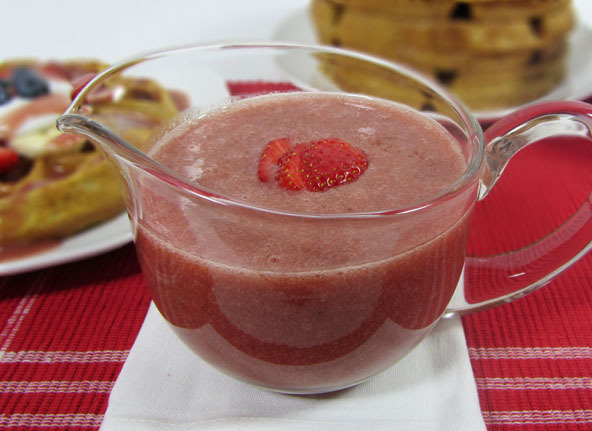 See recipe for Wholetarian Blend Syrup or Karly’s Pancake Waffle Syrup.